If you rely on your calendar app to keep yourself focused and productive, you’ll quickly run into the limitations of Apple’s Calendar (known before its Mountain Lion incarnation as iCal). 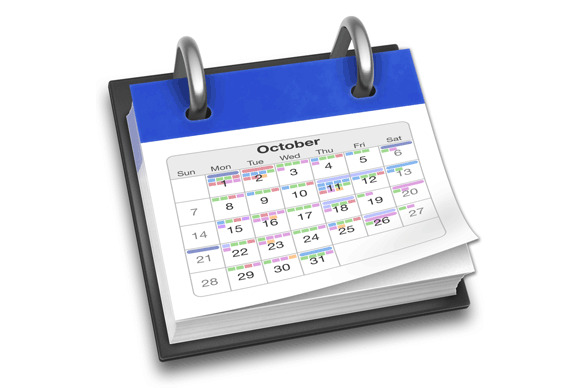 Many individuals and workgroups who need to share calendars turn to BusyMac’s BusyCal. Sporting a face-lift and a slew of welcome new features, BusyCal 2 will be a worthwhile upgrade for most users, but will require workflow changes for some people. And if your organization is dependent on Microsoft Exchange, BusyCal is not, for now, an appropriate choice. 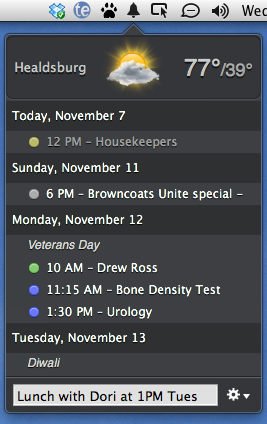 BusyCal 2 requires Mountain Lion (although it still supports BusyCal 1.6 clients running on previous versions of OS X). It supports Notification Center, synchronizing and sharing calendars between two or more people using the standard CalDAV protocol. The most common CalDAV services are iCloud and Google Calendar, but BusyCal works with many other CalDAV implementations; the program can also synchronize directly with other copies of BusyCal on a LAN. Unlike Apple’s Calendar, which split tasks (called "To Dos" in BusyCal) into the new Reminders app, BusyCal integrates events and To Dos into one program. BusyCal continues to boast superior features over Apple’s programs for event and task creation and management, especially those that repeat. Entries you make in BusyCal are immediately pushed to the CalDAV server. Show Me, Tell Me Clearly: The new menu-bar app shows you today’s weather, lists upcoming event details, and lets you enter new events in natural language. No iOS version of BusyCal exists, but any changes you make in any iOS calendar or task-management app (including the company’s own BusyToDo) that sync to iCloud will automatically sync to BusyCal. Google Calendar doesn’t support syncing of To Dos. BusyCal 2 drops support for Apple’s deprecated Sync Services system framework, so it no longer synchronizes with iOS devices via iTunes. BusyCal adds a new Quick Entry companion app that lives in your menu bar so that it’s always available; it provides a small window with today’s weather, upcoming events, and a text-entry field that accepts natural-language event details such as “Dinner with Dori next Tues at 6.” Pressing Return creates the event (or To Do) in BusyCal and opens the item’s Info window for further details. This entry-from-the-menu-bar feature was popularized by Flexibits’ $20 Fantastical ( ); it’s worth noting, though, that BusyCal’s natural-language implementation isn’t as smart and flexible as Fantastical's approach. You can set up meetings in BusyCal on an iCloud or Google calendar, attaching one or more people from your Contacts, and the server will send the recipients’ copy of BusyCal a meeting invitation in their Inbox in the toolbar. They can respond with Decline, Maybe, or Accept. Because Google Calendar has a less robust set of features than iCloud does, the upgrade to BusyCal 2 will require some Google Calendar users to change the way they do things. For starters, you can't create calendars in BusyCal—you must create calendars (or, if you're an upgrader, re-create them) on Google and then subscribe to those calendars from BusyCal. In addition, several things that are supported on iCloud are not supported on Google Calendar, including To Dos, graphics on events or days, alarms with sound, room scheduling, and file attachments. One big advantage of Apple’s programs (Calendar, Mail, Reminders, and Contacts) is their support for Microsoft’s Exchange Server. BusyCal's developers told me that they understand Exchange support is important, and that they plan to add direct support for Exchange in a future release. Outlook and Entourage also don’t sync with BusyCal, since they relied on Sync Services. It’s your calendar, and you should be able to display its information to best serve your needs. 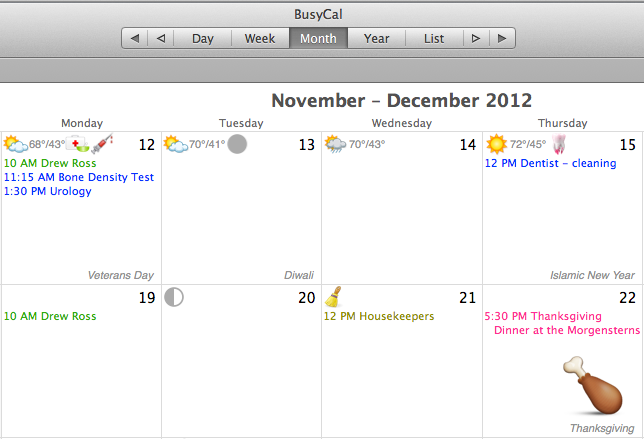 BusyCal has always added a useful List view to the expected Day, Week, Month, and Year views. Calendar doesn’t allow much in the way of customized views, an area in which BusyCal shines. In BusyCal you can customize the number of weeks shown per month, or the number of days per week. If you are in Week or Month view, and you want to see the previous (or next) day or week without switching views, the handy Previous Incremental or Next Incremental buttons in the toolbar let you move your view forward or backward. BusyCal previously displayed weather for the next ten days, and moon phases as icons; new to BusyCal 2 is a Graphics panel, which allows you to add icons to individual events and days. Icons come from OS X’s Emoji character set and from Icon Finder; you can also drag your own graphics into the Favorites portion of the Graphics panel. See It Your Way: In this screenshot, I’m nominally in Month view, but I’ve used the Next Incremental button to display a week from the following month. Additionally, you can see how BusyCal uses the date header to display icons for upcoming weather, event icons, and phases of the moon, and how you can place icons for entire days, such as the turkey drumstick on Thanksgiving. The new Smart Filters let you save custom views with a subset of your calendars, and you can direct the filter to show events that match the particular criteria you set. For instance, if you want to see just the meetings of your volunteer group in List view, you can create a Smart Filter for that. Smart Filters automatically appear in a Favorites bar at the top of the window. A new Find window works independently of the current calendar view, and now lets you search through your entire calendar rather than just the current calendar display. This feature is great for things like digging up a particular doctor’s appointment you had sometime last year, or finding all your appointments with a particular coworker. One of the big changes in BusyCal is how you buy it: The program is now available only through the Mac App Store. Accordingly, it benefits and suffers from the App Store’s policies. Previous versions of BusyCal were priced at $50 per user, with an $80 family pack covering up to five users. The Mac App Store version of BusyCal 2 is priced at $30 until December 31, 2012, after which it will be $50. As with any app from the App Store, it can be installed on any computer that uses the same Apple ID. For larger workgroups, customers must buy additional seats using a different Apple ID, which will quickly become an administrative hassle. Previously, customers could purchase quantity-discounted licenses from BusyMac. I can’t fault BusyMac because Apple still hasn’t gotten around to offering volume licensing on the App Store; but if you manage larger workgroups, you need to be aware of what you’re getting into. If you’re already a BusyCal user, you’ll find the upgrade to be well worth the cost, especially if you purchase it before the end of the year. The new Smart Filters and Find window save time and effort. The Quick Entry app is useful for glancing at today’s weather and agenda, as well as for adding new events and tasks. And since events and tasks go hand in hand for most people, BusyCal’s integration of the two is far superior to Apple’s separation into discrete Calendar and Reminders apps.